Chelsea’s trip to Manchester City might decide the Premier League title, but referee Mike Dean is ready and waiting to steal the show. Can a genius ever be truly appreciated in their own lifetime? Or does co-existence — being forced to watch extraordinary people do frankly ordinary things — bring a certain amount of disenchantment? Hey, look, it’s Mozart! Oh, he’s picking his nose. Hey, look, it’s Messi! Oh, he’s been tackled. All referees are a little ridiculous, for it is a ridiculous job. And you suspect all referees have to be a little self-regarding, since who else is going to regard them? They get abuse for getting things right, abuse for getting things wrong, abuse for things that have nothing to do with them. Perhaps half their job is making decisions; the rest is to act as a kind of scapegoat-pinata for the hordes of angry men that inhabit and surround football, and like to shout all the time. But even within this rarified club of strange and strangely heroic officials, Dean stands alone. He has — and there really is no other word for it — style. Ordinary gestures are rendered exceptional by a pause for effect here, a flourish there. Nobody has ever enjoyed awarding a throw-in quite as much. Yet enjoying one’s job is one thing. Dean pairs this relish with a simmering contempt for those poor fools whose jobs give him his job: the footballers. So alongside the grandiose advantages we get the no-look yellow card, the shake of the head, the “you give me no choice” frown, the “what else can I do?” shrug, and a thousand other variations on the same theme: football, a beautiful game refereed by a beautiful person, ruined by footballers. This is the key to the spectacle, the joy, the horror that is Dean. He loves this game. He loves to referee this game. He loves to be seen refereeing this game. And yet the game itself, the sweaty business of sportspeople running around … no. They ruin it, you see. With their silly fouls and their foul throws and their constant whining. He hates them; he needs them; they make him who he is; and he despises them for it. For they get in the way of what really matters. Pointing. Being seen to point. In Mike Dean’s dreams, 80,000 people turn up to watch him glide around an otherwise empty football pitch. They cheer his form as he awards a throw-in. They gasp as he points to the penalty area. They coo with appreciation as he describes a beautiful, arcing advantage. They are all wearing “100 NOT OUT” T-shirts, in anticipation of the impending milestone. 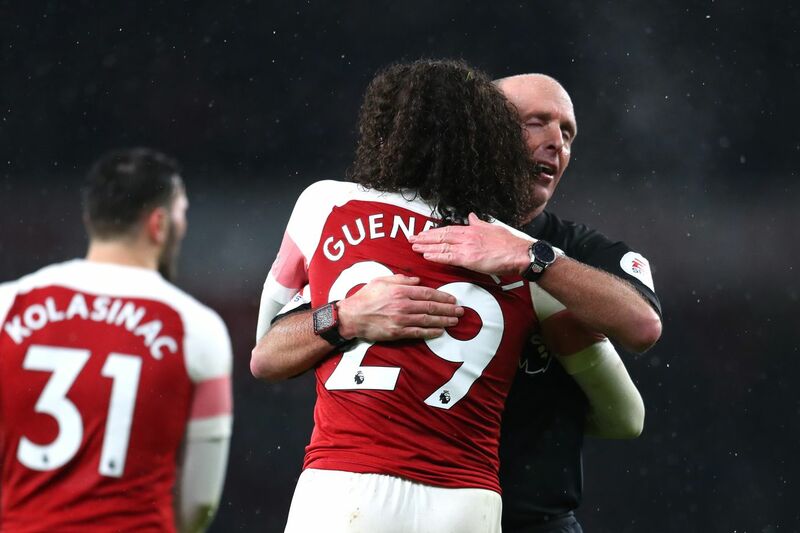 The sport of football is the requisite platform for the art of being a referee, which is of course itself merely the vehicle for the magnificence of being Mike Dean. Perhaps the performing referee has an advantage over other flavours of genius. Mistakes, moments of mortality, can all be folded into the wider performance. It doesn’t matter if Dean’s decisions are right or wrong; what matters is that he Mike Deans the hell out of them. And that, happily, seems to be completely unavoidable. The build-up to this weekend will focus on the title race. Liverpool will have played (and likely beaten) Bournemouth, so City will be looking to return to the top of the league. And Chelsea could be behind Manchester United by the time they kick off. But these are sideshows. The real occasion is this: Dean is currently sitting at 99 red cards in the Premier League. He has been for a few weeks now. He had the chance to send Leicester City’s Nampalys Mendy off last weekend, thanks to a couple of second yellows that might have been, against Manchester United, but the big man kept the big card in his pocket. Was he waiting for the bigger moment? To be the man that showed the card that maybe, just maybe, decided a title? Probably not. That would be highly unprofessional. But as coincidences go, it’s happily dramatic. Pause before the moment, pause before the moment, and then … just right. Pure class. Many thanks to the brilliant @CelebrityRefs.